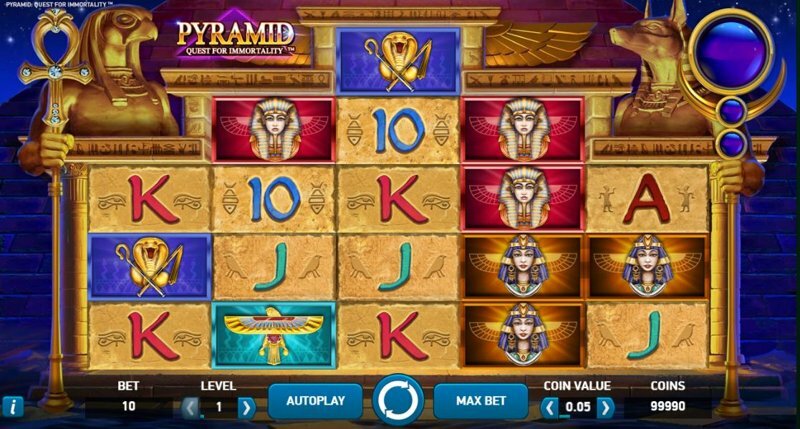 Pyramid: Quest for Immortality is a relatively new game from Net Entertainment (launched in 2016), and Net Entertainment have combined some of their most popular game mechanisms into this new, Egyptian-themed slot. You’ll see the falling blocks feature from Gonzo’s Quest, a 720-ways-to-win layout, inspired by When Pigs Fly and Reel Rush, as well as an increasing multiplier and more. While the game doesn’t rank top in terms of design, Net Entertainment haven’t done a bad job; it just lacks a little charisma. The background shows two Pyramids, subtly lit with a beautiful moonlit sky, and on each side of the reels, you’ll see two Egyptian Sphinx-type statues, one holding a staff, and the other holding half a staff, with the other half reserved for multiplier action later on in the game. The minimum bet on Pyramid: Quest for Immortality is just £0.10 – one of Net Entertainment’s lowest – and while you can’t change the number of pay lines (it’s a 720-ways-to-win game, remember), you can adjust the coin value, and the bet level, to set a stake that’s affordable to you. Pyramid: Quest for Immortality is also available for mobile players, with Net Entertainment’s release of the slot coming to desktop and mobile devices right off the bat. First of all, you only need one symbol on three consecutive reels (left-to-right) to secure a win. If you have symbols on reels 4 and 5, then great – you’ll have 4-of-a-kind and 5-of-a-kind pay lines – and multiple identical symbols on one reel is even better, as it doubles how many times you get paid on a line. Now, when you have a win, the symbols that make up the win “implode”, with the symbols above them dropping down to take their place. Every time this happens, you’ll notice the Statue on the left-hand-side of the reels we talked about earlier displays a new light – every three wins, a multiplier increases, first 2X, then 3X, followed by 5X, and 10X. 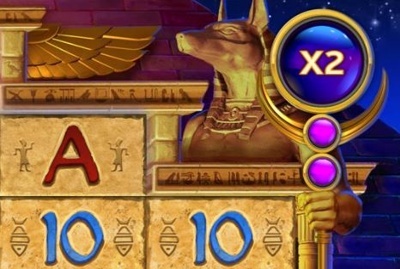 Now, another important thing to note, is that if a winning line uses the top symbol on either reels 2, 3, or 4, a wild symbol is guaranteed to drop down on the next spin – so in essence, if you have a win involving the top symbols on reels 2 and 3, you’re guarantees a win on the next spin. It sounds a little complex – but it’s really not. Once you get the hang of it, it’s really simple to understand, and while the wins at first are fairly poor, once you manage to get the multiplier up, and have a few wilds on the screen, 4-of-a-kind and 5-of-a-kind pay lines can be worth a lot of money, so this is definitely a game to check out.